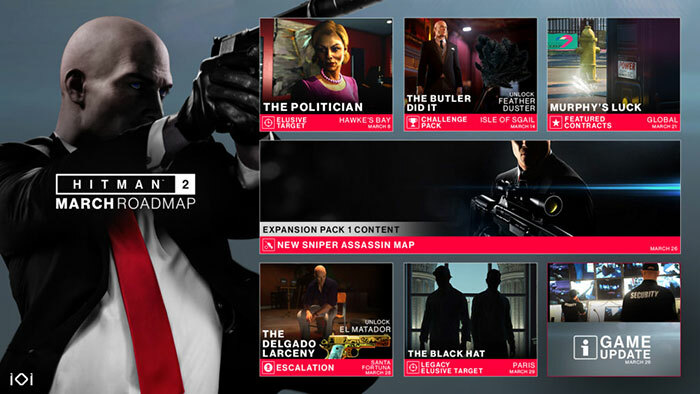 A few hours ago IO Interactive released its March Update (v2.20) for Hitman 2. The update is quite significant for PC gamers, as it includes not just extra content but Microsoft DirectX 12 support, as well as some other PC-specific enhancements and fixes. Looking back, Hitman was one of the first games to support DX12, so it was striking when Hitman 2 was released as a DX11 only title last November. Hantu Port, Singapore has been added to Hitman 2 as part of the Expansion Pass. It is the first sniper assassin content for this edition of the game and you can play solo as Agent 47, or online coop as either Stone or Knight. In the sniper role you will be positioned above the container yard at the port, pictured above, and have to eliminate all Khandanyang operatives (including 3 main targets) while protecting the hostages. During the mission your weapon of choice will be a variant of the Druzhina 34 sniper rifle which has a medium fire rate. Ammo can be chosen for its various piercing abilities or even explosive nature. Your rifle is equipped with a scope offering three zoom levels. You can read more about the targets and further content in March on the Hitman blog. The PC update that started rolling out yesterday is approximately 1.8GB (compared to 1Gb on the consoles). DX12 support on PC comes with a number of provisos; you must have an AMD or Intel DX12 GPU, or an Nvidia GeForce 900 series or better graphics card. Several issues have been fixed too; motion blur, benchmark stats, multiple monitor support, taser trigger, stretched outfits, and Pip modes have all been patched in the v2.20 update. Is there any benefit to selecting the DX12 mode? As you might expect, the benefits depend on your PC hardware but DSO Gaming's initial report suggests a "15-40fps increase in CPU/RAM-limited scenarios". In its testing of the Mubai and Miami benchmarks, on a beefy modern PC, it seems that the minimum frame rates benefitted more than the maximum fps observed. The site also shares some screenshot comparisons of Hitman 2 in DX11 and DX12 modes. Another thing worth mentioning is that "some crashes and some additional stutters" were observed in DX12 mode, so it might need another update or two to become as stable as DX11 mode.